In this tutorial we will give you some insights regarding the architectural visualization post production process in Photoshop based on a rendering we made with 3d Studio MAX and Vray. In particular we use a special technique based on certain render elements like VrayRawShadows, VrayWireColor, VrayExtraTex, to speed up the work in Photoshop. 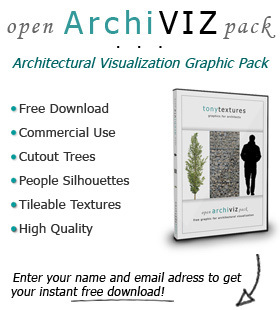 We mainly use our tonytextures architectural entourage and show you where to get e.g. 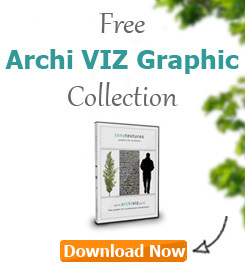 the free downloads so you can learn how to work with our graphics the best way – so lets get started! How to create a rainy mood in Photoshop? Architectural visualization should awake emotions so it is quite imporant to create the right atmosphere in your rendering! Typically most renderings shows sunny spring weather with light blue sky and perfect green trees. But sometimes you want to stand out or show your architectural design in another mood. In these cases a rainy situation can be an option too! Therefore we want to show you in this tutorial for architects how you can create a rainy mood in Photoshop based on a regular daytime rendering.